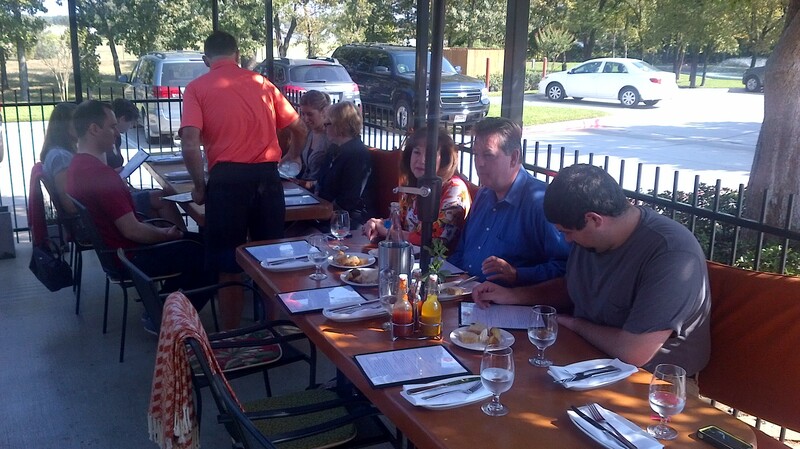 On Sunday, September 28, 26 happy Canadians joined Annette and Glen Doody at their Savory Bistro on 407 in Bartonville, near Lantana, Flower Mound and Argye. Line Cousineau of LC Hair Designs and Joe Scott of the Canadian-American Chamber of Commerce coordinated this joint event between the Chamber and the Canada Club. The Doody’s took the opportunity to share their collective love for scratch cooking with locally grown ingredients obtained from the local farmer’s market and meats and fish of the highest quality. Savory began with the concept of a meals-to-go then soon shifted to be a scratch kitchen. Guests sitting in the counter area witness the magic of the scratch kitchen as they watch the Doody’s son Neil and wife Jenna assemble their delightful dishes. For Thanksgiving, Canadians in North Texas enjoy two options for celebrating. On Sunday, Savory Bistro will present a menu with a Canadian Thanksgiving theme and the Canada Club of North Texas will hold their annual Canadian Thanksgiving Potluck. Details can be found on Meet Up. Annual dues for Canada Club of North Texas cot $5 per year. Golfers, get signed up for our annual fall golf tournament. To register, visit our website at http://www.dfwcanadianchamber.com/events. By dfwcanadianchamber in Uncategorized on October 4, 2014 .